ThinkingPinoy was informed that he may be meeting with President Duterte really soon, and he shall tell him everything he wrote here. Note that ThinkingPinoy is a one-man team so he does not have proofreaders. He apologizes for any typographical errors because he's already too tired to proofread the article at this time. On 26 January 2018 press conference, Public Attorney’s Office Forensics Laboratory chief Erwin Erfe released the official forensic and histopathological report for the case of Anjielika Pestilos, who died on 06 December 2017. Pathologists from the Ospital ng Maynila Medical Center performed the histopathology. The Public Attorney’s Office commissioned three forensic teams for this report: (1) a Clinical Team of 3 specialist doctors, (2) a Medico-legal team of 3 doctors, and (3) a Pathology Team of 2 Pathologists. Viscerotropic disease (VTD) is an acute multiple organ system dysfunction that occurs following vaccination. The severity of VTD ranges from relatively mild multisystem disease to severe multiple organ system failure and death. CYD-TDV, marketed under the brand name Dengvaxia®, is a dengue vaccine in a yellow fever 17D backbone developed by Sanofi Pasteur, meaning Dengvaxia® is combination of the yellow fever virus and the dengue virus, albeit in a weakened form. Viscerotropic Disease, or in plain terms multiple organ failure, has been associated as a side effect of the yellow fever vaccine. In particular, no other than Stamaril®, Sanofi Pasteur’s own yellow fever vaccine, lists viscerotropic disease as one of its side effects. General Disorders and Administration Site Conditions: Cases of viscerotropic disease (known as YEL-AVD and formerly described as "Febrile Multiple Organ-System Failure"), some of which resulted in death, have been reported following yellow fever vaccination... The viscerotropic disease may manifest as fever, fatigue, myalgia, headache and hypotension progressing to metabolic acidosis, muscle and liver cytolysis, lymphocytopenia and thrombocytopenia, renal and respiratory failure. Note that thrombocytopenia refers to low blood platelet count: platelets are more formally called thrombocytes while the suffix “-penia” means deficiency. Myalgia, on the hand, refers to muscle pain. Simply put, yellow fever vaccine – including Sanofi Pasteur’s yellow fever vaccine Stamaril® – is known to have viscerotropic disease, a.k.a multiple organ-system failure, as a side effect. More formally, this side effect is called Yellow Fever Vaccine-Associated Viscerotropic Disease, or YEL-AVD. For example, a 2007 Yellow Fever mass immunization program of 42,000 Peruvians resulted in a number viscerotropism cases, four of whom died as result. Dengvaxia® is a live, attenuated vaccine, so it contains a version of the living dengue virus that has been weakened so that it does not cause serious disease in people with healthy immune systems. Because live, attenuated vaccines are the closest thing to a natural infection, they are good teachers for the immune system. Aside from being “live (alive) and attenuated (severely weakened)”, Dengvaxia® has also been described as a “chimeric” vaccine, as it is a combination of two viruses. Viruses have two basic parts: a nucleic acid core and a casing. In Dengvaxia®’s case, the core is RNA from the Dengue virus, while the casing is from the yellow fever virus. Thus, Dengvaxia® has a commonality with Sanofi Pasteur’s Stamaril®: the yellow fever virus casing; suggesting that Dengvaxia® and Stamaril® may share some common side effects. Let ThinkingPinoy break this down for the reader. First, “sensitization to severe dengue infection” is, in simple terms, the worsening of the symptoms of a disease that a drug is supposed to alleviate or even eliminate, something that has been extensively discussed in the ThinkingPinoy article “#DengGate: Mr. President, here’s the memo you asked for”. Second, “acute viscerotropic disease” or multiple organ-system failure, which is the main contention of this article. Third, “acute neurotropic disease”, in the case of some yellow fever vaccine recipients, manifest as meningoencephalitis, Guillain–Barré syndrome (GBS) or acute disseminated encephalomyelitis. Meningoencephalitis is the inflammation and/or bleeding of the brain and/or its surroundings; Guillain–Barré syndrome is when a person’s immune system attacks a part of the nervous system; and encephalomyelitis as inflammation of the brain and the spinal cord that damages the protective covering of nerve fibers. This bears repeating: in as early as 10 December 2015 and by Sanofi’s own admission, Dengvaxia® has the theoretical possibility of causing the following side effects. Adding the fact that it was published in a widely-read scientific journal means that the risks must have been publicly known. With that said, the operative term here is still “theoretical” as opposed to “confirmed”. Moreover, the Philippine Food and Drug Administration regulators can claim that they may have not seen Sanofi’s 10 December 2015 journal article yet when they issued Dengvaxia®’s Certificate of Product Registration in 22 December 2015, i.e. there wasn’t enough time because the two dates are just calendar 12 days apart. But here’s the problem: FDA knew it all along. DoH, Sanofi and a coverup? 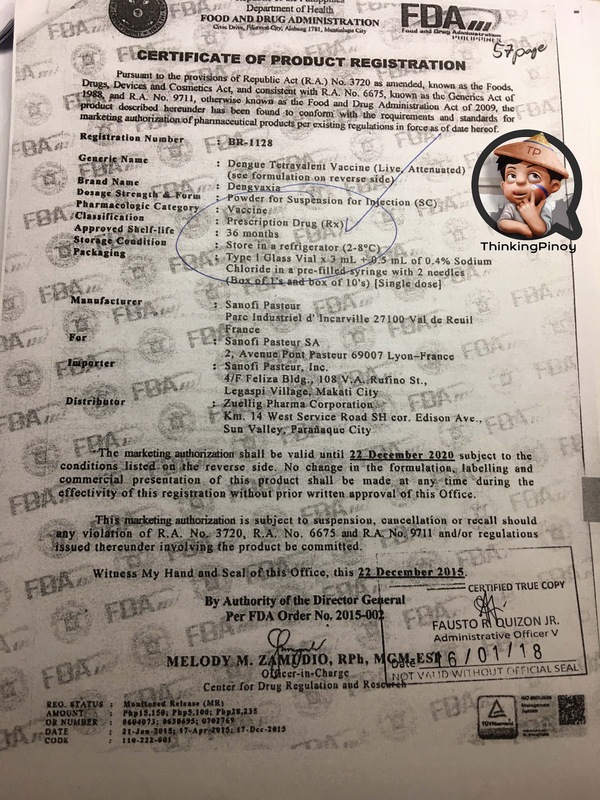 ThinkingPinoy obtained a copy of Dengvaxia®’s Certificate of Product Registration (CPR), along with the Sanofi Dengvaxia®’s filled-out “Initial Marketing Authorization Application Form”. The Marketing Authorization form is required for the issuance of CPR, which is basically Dengvaxia®’s Philippine license to sell. A cursory look at Sanofi’s CPR shows that it was classified as Prescription Drug (Rx), which is already a red flag. Why would then Health Secretary Janette Garin and her co-conspirators use an EXPERIMENTAL prescription drug in a Mass Vaccination Program? But why, exactly, was FDA compelled to classify Dengvaxia® as a prescription drug? A look at Sanofi’s application, embedded below, reveals several soul-crushing reasons. Aside from the two known side effects of Sanofi’s yellow fever vaccine Stamaril® that were identified earlier (i.e. viscerotropism and neurotropism) and were cited as a potential side effect of Dengvaxia® ®, Sanofi also admitted TO THE FDA that Dengvaxia’s list of potential side effects may include (1) anaphylactic reactions, which may cause sudden death due to respiratory failure and/or sudden decreases in blood pressure; (2) increase in severity of Dengue Disease, which the public has already been informed about recently; and (3) waning protection from Dengue over time. Despite the FDA having full knowledge of Dengvaxia®’s potential side effects, it is alarming to discover that Dengvaxia®’s Full Prescribing Information, includes only “serious allergic reaction”, i.e. anaphylaxis, among the list of side effects listed in the Marketing Application. This bears repeating: the FDA-approved label for Dengvaxia® does not state the risk of viscerotropism, neurotropism, waning effectiveness, and enhanced dengue symptoms. In short, FDA deliberately helped Sanofi – to the detriment of the Filipino People – by not letting our citizens know that Dengvaxia® may cause multiple organ failure, severe nerve damage, enhanced dengue symptoms, and decreasing protection from dengue over time. As shown in the previoussection , the anti-Dengue vaccine Dengvaxia® shares a few common possible side effects with its anti-Yellow Fever “sister-vaccine” Stamaril®, the most controversial of which is viscerotropism, which is multiple organ-system failure. Unlike Dengvaxia®, however, multiple organ-system failure is included in Stamaril®’s product label. This may sound puzzling because both vaccines are from Sanofi Pasteur. Given this, why would Sanofi be reluctant to do the same for Dengvaxia®? The obvious answer would be that any salesman does his best to downplay the disadvantages of whatever he sells. By not mentioning possible multiple organ-system failure, it would be a lot easier to sell Dengvaxia®. But a closer look shows a darker picture. While Stamaril® is confirmed to cause rare instances of multiple organ-system failure at a rate of about 0.4 per 100,000 doses, one dose of the vaccine provides life-long protective immunity against Yellow Fever. On the other hand, the frequency of multiple organ-system failure for Dengvaxia® recipients, while probably low, is still unknown. Moreover, Sanofi itself admitted that Dengvaxia®, unlike its sister-vaccine Stamaril®, provides DECREASING protection over time, i.e. it provides TEMPORARY and NOT LIFE-LONG protection. Add the fact that instead of providing protection from dengue, it actually WORSENS dengue symptoms to those who have never been infected with Dengue before vaccination. 1 - STAMARIL®: Suppose you were offered the vaccine Stamaril® that has a 0.0004% chance of destroying your internal organs but will most likely give you lifetime protection from yellow fever, a disease that has a 15% chance of destroying your internal organs, would you accept the offer? You most probably would, because the advantages obviously outweigh the disadvantages. 2- DENGVAXIA®: Suppose you were offered the vaccine Dengvaxia® that has a small but still unknown chance of destroying your internal organs, a vaccine that work only 60% of the time, and will provide you only temporary protection from dengue fever with a chance of worsening dengue symptoms if and when you get infected, will you accept the offer? You most probably will decline the offer, because the tradeoffs are just too much. In Probability Theory, the Law of Large Numbers dictates that a low-probability event happens given a sufficient of trials. Modestly assuming a 0.0004 percent chance of multiple organ-system failure PER DOSE of Dengvaxia®, 3 million doses administered would translate to approximately 12 cases. Note, however, that the quoted probability is just based on passive surveillance of recipients of the yellow fever vaccine, so that real-world figures for the dengue vaccine -- which are unconfirmed because the drug up to now is still experimental -- may be higher. That in the off-chance that the vaccine works, the protection is merely temporary, as opposed to many other more familiar vaccines that provide life-long protection. Worse, they did not inform some of the parents at all, such case of the child from Tarlac that ThinkingPinoy investigated  in December 2017, a case that no less than the Deparment of Health tried to cover up. And it doesn’t help that Department of Health Secretary Janette Garin actively promoted Dengvaxia® as if she’s part of Sanofi’s marketing department. In an interview interview that took place barely two weeks after FDA approved Dengvaxia®, Garin said, “[Dengvaxia®] is recommended to those 9 to 45 years old”, failing to mention any serious side effect. I have reason to suspect that Garin and her accomplices in the government did all these for personal gain, as evidenced by leaked emails that demonstrate the Health Department’s uncanny enthusiasm to get the vaccine approved, purchased, and mass-deployed in record time. By the looks of, the Dengvaxia® saga appears to be following a storyline similar to Merck’s blockbuster painkiller Vioxx®. Vioxx® was eventually pulled out in 2004 after the FDA itself confirmed the heart risk, with Merck agreeing to pay $950 million in fines, aside from other possible claims arising from invididual personal injury lawsuits. Now, let’s compare that to Dengvaxia®’s situation. Just like Vioxx®, Dengvaxia® has a potential side effects (multiple organ-system failure, nerve damage, severe dengue, etc) that warrants a larger confirmatory study, some of which have manifested when Sanofi tested kids aged up to 9 years old. Instead of conducting the study, Sanofi simply told regulators that it’s ok to use Dengvaxia® for those over 9 years old and at the same time told them that there’s an off chance that such catastrophic side effects may occur. 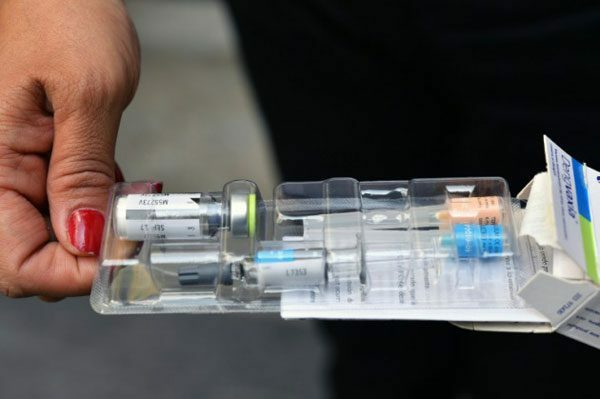 A year after the mass immunization’s launch, Sanofi finally confirms one of the side effects: that it enhances dengue symptoms among seronegatives. Sanofi’s admission indeed hurt their drug’s sales, but there’s still some hope because the press release only affects seronegative recipients. Sanofi can still tap the seropositive market, i.e. those who have had a previous dengue infection, with an added bonus: Sanofi can develop and sell test kits that tests for seropositivity, providing Sanofi with an additional revenue opportunity. Should Sanofi be fined several years later for concealing information and cheating the system, they would’ve already had earned billions from Dengvaxia®, and they can use those billions to pay fines and other personal injury claims, similar to what Merck did with Vioxx®. But here’s the problem: the Public Attorney’s Office appears to be foiling that plan. But here’s Sanofi’s monumental problem: Dr. Erwin Erfe, Atty. Persida V. Rueda-Acosta, and their colleagues at the Public Attorney’s Office PAO are starting to confirm what DoH and Sanofi deliberately concealed since 2015... that Dengvaxia may cause viscerotropism, or multiple organ-system failure. Erfe’s 26 January 2018 announcement on the official forensic and histopathological report for the case of Anjielika Pestilos, where he mentioned the term “viscerotropic-like disease”, is a nightmare not only for Sanofi Pasteur and its billion-dollar Dengue vaccine program, but also to all the Health Department officials involved in this grand scheme of deception. To make matters worse for Sanofi, preliminary results show that some of the other Dengvaxia® cases handled by PAO may follow the same trajectory as that of Anjielika’s. If Erfe and Co. somehow succeeds to prove a link between Dengvaxia® and any of the major side effects, a personal injury class suit will surely follow, which may cost the financially ailing Sanofi billions in damages and billions in lost potential revenues. Yes, there’s a chance that Erfe and the Public Attorney’s Office may destroy Sanofi, France’s largest pharmaceutical company… or at least hurt it to the tune of a few billion dollars. And that’s why Sanofi and its allies in the Philippine government is pulling out all stops to discredit the Public Attorney’s Office, as it sends all the medical professionals in its payroll to attack the credibility of PAO, especially those of Dr. Erwin Erfe and PAO chief Atty. Persida Rueda-Acosta. Note: References are listed below. Public Attorney’s Office Press Conference held on 05 February 2018 in the PAO headquarters in Quezon City, Philippines. Nieto, R.J. Phone interview with Public Attorney’s Office head Atty. Persida Rueda-Acosta. ThinkingPinoy. 03 February 2018. Erfe, E. Facebook Post. 06 February 2018. Erfe is the director of PAO’s Forensic Laboratory. Gershman et Al. “Viscerotropic disease: Case definition and guidelines for collection, analysis, and presentation of immunization safety data”. Vaccine Vol. 33 Issue 33. 13 July 2012. World Health Organization - Global Advisory Committee on Vaccine Safety. “Safety of CYD-TDV dengue vaccine”. WHO Weekly Epidemiological Report. 21 August 2015. Thomas, R. “Yellow fever vaccine-associated viscerotropic disease: current perspectives”. Drug Design, Development and Therapy 2016; 10: 3345–3353. 12 October 2016. “Stamaril: Side Effects / Adverse Reactions”. MIMS-Singapore pharmaceutical database. Mayo Clinic Staff. “Thrombocytopenia (low platelet count)”. Mayo Clinic. 31 March 2015. Schmerling, R. (MD). “Approach to the patient with myalgia”. UpToDate. 25 April 2016. World Health Organization - Global Advisory Committee on Vaccine Safety. “Safety of yellow fever vaccine”. WHO Weekly Epidemiological Report. 8 August 2008.
 WHO Working Group on Technical Specifications for Manufacture and Evaluation of Yellow Fever Vaccines. Meeting Report. World Health Organization. 13 May 2009. p. 7. Centers for Disease Control. “Understanding How Vaccines Work”. United States Centers for Disease Control. February 2013. Lodish, H. et Al. “Section 6.3 Viruses: Structure, Function, and Uses”. Molecular Cell Biology 4th Edition. WH Freeman and Co. 2000. Smith, P. ”Dengue Vaccine (CYD-TDV ‘Dengvaxia®’) Clinical Trial Results”. World Health Organization - Strategic Advisory Group of Experts (SAGE) on Immunization. 14 April 2016. Guy, B. et Al. “Development of the Sanofi Pasteur tetravalent dengue vaccine: One more step forward”. Vaccine Volume 33, Issue 50. 10 December 2015. p. 7100-7111. Robertson, T. Sensitization to Drugs. University of Michigan-Ann Arbor Department of Psychology. Springer, Berlin, Heidelberg. 09 February 2014. Nieto, R.J. “#DengGate: Mr. President, here’s the memo you asked for”. ThinkingPinoy. 13 December 2017. Florczak-Wyspiańska, J. et Al. “Yellow fever vaccine-associated neurotropic disease (YEL-AND) – A case report”. Neurologia i Neurochirurgia Polska Vol. 51, Issue 1. January–February 2017. p. 101-105. National Institutes of Neurological Disorders and Stroke. “Meningitis and Encephalitis Fact Sheet”. United States National Institutes of Health. Last modified 08 May 2017. National Institutes of Neurological Disorders and Stroke. “Guillain-Barré Syndrome Fact Sheet”. United States National Institutes of Health. Last modified 10 May 2017. National Institutes of Neurological Disorders and Stroke. “Acute Disseminated Encephalomyelitis Information Page”. United States National Institutes of Health. Last modified 23 May 2017. CNN Philippines Staff. “TIMELINE: The Dengvaxia® controversy”. CNN Philippines. 06 February 2018. Ewan, P. “Anaphylaxis”. British Medical Journal 316(7144): 1584. 23 May 1998. Nieto, R.J. “#DengGate: Aquino’s Garin ignores WHO warnings, risks 700k Filipino kids’ lives”. ThinkingPinoy. 03 December 2017. “Dengvaxia: Side Effects / Adverse Reactions”. MIMS-Philippines pharmaceutical database. Gotuzzo, E. et Al. “Efficacy and Duration of Immunity after Yellow Fever Vaccination: Systematic Review on the Need for a Booster Every 10 Years”. The American Journal of Tropical Medicine and Hygiene 89(3): 434–444. 04 September 2013. Seligman, SJ. “Risk groups for yellow fever vaccine-associated viscerotropic disease (YEL-AVD)”. Vaccine 32(44):5769-7. 07 October 2014. Vaccine efficacy against confirmed dengue pooled across both trials ewas 59.2% in the year following the primary series (per protocol analysis). “Questions and Answers on Dengue Vaccines”. World Health Organization. Nieto, RJ. “#DengGate: Kid in ICU for Dengue only 3 months after 3rd Dose”. ThinkingPinoy. 05 December 2017. Nieto, RJ. “#DengGate: Botched Tarlac Dengvaxia® case hints DoH coverup”. ThinkingPinoy. 05 December 2017. HeadStart with Karen Davila. “PH spending P3-B on dengue vaccines”. ANC. 03 January 2016. Nieto, RJ. “#DengGate: Leaked emails show Pnoy, Garin, Hartigan-Go intentionally bent rules for Sanofi”. ThinkingPinoy. 05 February 2018. Harris, G. et Al. “Despite Warnings, Drug Giant Took Long Path to Vioxx Recall”. NY Times. 14 November 2004. Wilson, D. “Merck to Pay $950 Million Over Vioxx”. NYTimes. 22 November2011. Sanofi. “Sanofi updates information on dengue vaccine”. Press Release. 29 November 2017. Blamont, M. et Al. “Sanofi's M&A misses frustrate some investors in drugmaker”. Reuters. 20 January 2017.